Every time I open my stash, skeins and skeins of DK throw themselves at me, just begging to be knitted with. Especially the pastel colours I've had in there for well over a year now. Finally, I have had ideas on what to knit with them. Lots and lots of baby blankets. I've discovered a love of knitting up boring pastel colours and creating something cute and practical. Last week I started a blanket for my Mum's friend at work, who is expecting a baby. I've almost finished it, and will tell you more later on in the week but in short, it is purple, yellow and white. And I love knitting it. Since casting on this blanket, I've found I look at my yarns differently. I used to consider "baby pink" a useless colour, but now I see it as a stripe in a pink & white blanket. As well as baby blankets, I am planning to make a shawl. 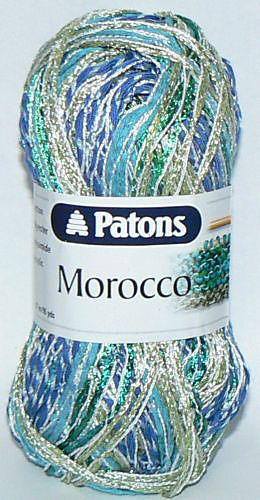 I've had 3 skeins of Morocco by Patons in my stash for almost a year now, and I just didn't know what to make with it. When I found myself sat in bed cuddling it, it whispered to me "kerchief... I want to be a kerchief..." I bolted up right, logged on ravelry and found The Age of Brass & Steam Kerchief by Orange Flower. I have no idea whether I'm going to gift it or keep it for myself, but at least I know what I'm going to make, that is something, isn't it? Now I am knitting socks (I casted on my second pair a while ago...) my Mum is eyeing up a pair. I was sat knitting Sara's socks the other day when Mum came up to me and decided "I think my pair will be a dark purple...". So it looks like I am going to be knitting her a pair of socks, too! Fortunately last year my Nan had given me a skein of Suberba Chinée by Rico Design in a lovely dark purple colourway. I have 2 skeins of Albero by Louisa Harding also hiding in my stash, which is just lush stuff. I attempted to knit the Reversible Lace Beanie Hat from an issue of Simply Knitting earlier this year, but it was a train wreck and ended up getting frogged. I hope to resurrect the project, finish it and gift it to my youngest sister, Katy (who is one of the lucky ones who can wear a hat and look cool). For now though, why don't you head on over to the Underground Crafter, the genius behind this meme, for more posts about gift-worthy yarns & their projects. Wow! You have a lot going on there. I can't wait to see how everything turns out. Looks like you have a fun range of ideas for your yarns!